Stamps.com - How Much is a Stamp? If you’re mailing postcards, letters and larger envelopes, you’re almost certainly sending them via First Class Mail. The USPS processes and delivers over 490 million mailpieces each day, and the bulk of those are First Class Mail letters. First Class Mail is low cost and includes speedy delivery with your mailpiece typically reaching its destination within two to four days anywhere in the U.S.
What is the Cost of a First Class Mail Stamp? Most First Class Mail letters include general correspondence such as billing invoices, credit card statements and birthday cards. These items typically weigh one ounce or less. The cost of a one-ounce First Class Mail stamp is $0.55 at the Post Office, or $0.47 if you buy and print stamps online using Stamps.com. When you purchase postage stamps online using a PC Postage vendor such as Stamps.com, you are eligible to receive postage rate discounts. These discounts are provided since printing postage online benefits the USPS with reduced congestion at the Post Office and providing mailpieces that have addresses pre-cleansed and bar coded. When you purchase postage via Stamps.com, you’ll enjoy multiple benefits, all from the comfort of your own home or office. Print your postage directly onto your envelopes or postcards, or onto shipping labels 24 hours a day, 7 days a week. You can get mailings out on your time, at your convenience. Stamps.com provides detailed bookkeeping reports allowing you to track postage purchases, mail classes used and employee activity along with shipment tracking. Put an end to guesswork and overspending! 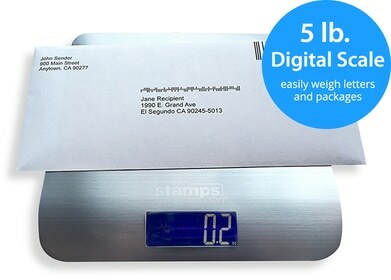 When you place your letter or postcard on your Stamps.com scale - which you’ll receive free with your account (just pay shipping and handling) - the software receives the exact weight to generate the correct postage. In addition, Stamps.com helps you choose the best mail class for your delivery needs.